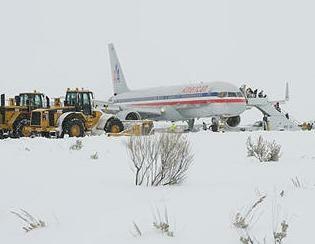 December 31, 2010 - The National Transportation Safety Board has opened an investigation into an incident in which a passenger jetliner that had landed at Jackson Hole Airport in Wyoming failed to stop after touchdown on Thursday. At about 11:38 AM MT on Thursday, American Airlines Flight 2253, a B-757 (N668AA) inbound from Chicago O'Hare International Airport, ran off the end of runway 19 while landing at Jackson Hole Airport. No injuries were reported among the 181 passengers and crew on board. The pilot reported that the braking system failed. Flight 2253 continued down the runway, passing the end of the runway and through the runway overrun area which was 300 feet. The aircraft finally came to rest about 350 feet from the overrun area in hard packed snow. The pilot came on the intercom to reassure passengers that they were ok and stated that the brakes weren?t working properly. Airport officials brought in heavy plows and airport workers began plowing an area around the Boeing 757. A portable staircase and buses were brought in and it took just under an hour before all 181 passengers and crew were able to disembark the aircraft. Aircraft can and do overrun the ends of runways, sometimes with devastating results. An overrun occurs when an aircraft passes beyond the end of a runway during an aborted takeoff or while landing. To minimize the hazards of overruns, the Federal Aviation Administration (FAA) incorporated the concept of a safety area beyond the runway end into airport design standards called ?runway overrun area?. To meet the standards, the safety area must be capable, under normal (dry) conditions, of supporting the occasional passage of aircraft that overrun the runway without causing structural damage to the aircraft or injury to its occupants. The safety area also provides greater accessibility for emergency equipment after an overrun incident. There are many runways, particularly those constructed prior to the adoption of the safety area standards, where natural obstacles, local development, and/or environmental constraints, make the construction of a standard safety area impracticable. There have been accidents at some of these airports where the ability to stop an overrunning aircraft within the runway safety area would have prevented major damage to aircraft and/or injuries to passengers (see Runway Overrun May Have Prevented Flight 331 Accident). Recognizing the difficulties associated with achieving a standard safety area at all airports, the FAA undertook research programs on the use of various materials for arresting systems. These research programs, as well as, evaluation of actual aircraft overruns into an EMAS have demonstrated its effectiveness in arresting aircraft overruns. The weather was reported to be snowing at the time of the incident. No damage to the aircraft has been reported. Senior NTSB Air Safety Investigator Joseph Sedor has been designated as the Investigator-In-Charge. At this time parties to the investigation are American Airlines, Boeing, the Allied Pilots Association and the Federal Aviation Administration.